When I was a kid and I asked my parents a question about astronauts, dinosaurs, puppies, or violins, they’d often point me toward our set of encyclopedias and say, “Look it up.” Nowadays when my son asks the same kinds of questions, one of the first places we go to look something up is…YouTube! He could happily watch YouTube for hours, and when we go on a trip, he’s always disappointed he can’t stream his favorite YouTube channels on his Wi-Fi only tablet while we’re in the car. So the next time, I’m definitely using Downie, online video downloader for Mac. Downie helps you download videos from YouTube, Facebook, Instagram, Vimeo, and other video sites. It even supports 4K videos. And if you love music videos and concert films on YouTube, Downie can even save just the audio. It’s crazy fast, too—if you have a decent internet connection, videos download and convert in no time at all. Save how-to videos for working on your model of car, or troubleshooting your smartphone or tablet, so you don’t have to go hunting again when something breaks. Search for full episodes of old TV shows that aren’t streaming anywhere else. Keep a local copy of your favorite hair and makeup tutorials—they’re easier to pause and rewind using native players than they are on YouTube.com. Save the audio from one of those absurdly long white noise videos—my personal favorite is this one, 24 hours of the engine drone sound from Star Trek: The Next Generation. Download motivational speeches—or maybe you prefer standup comedy specials—and listen to them on your morning commute to get pumped for the day. Download online videos your kids watch over and over and over again so you aren’t using your capped Internet bandwidth to stream them every single time. You could even save videos that you suspect might be taken offline soon, like full-length movies. Drag and drop a URL from your browser’s URL bar onto Downie’s app window or dock icon. Use the browser extension, which is the easiest method. If you have Safari, you don’t even have to download it—it comes with the app. Just restart Safari, open Safari > Preferences > Extensions, and check the box to enable it. Then when you’re on a webpage with video, just click the Downie button in Safari’s toolbar and watch it go. File > Open URLs… or Command-O. If you have a link in the clipboard, just switch over to Downie, and choose Command-O to open it. Drag in a text file, and Downie will scan it for links, even multiple links. The app allows you to dive into all corners—grab online videos from over 1,000 different sites like Vimeo, YouTube, Youku, and Bilibili. Not only is the app easy to use in terms of default settings, Downie also has tons of perks you can tweak. Download video from website in any way that suits your workflow, convert, postprocess, and extract audio only. Here’s a bit more detail. In the Preferences, you can set up Downie based on your workflow. For example, if you love listening to music on YouTube, you can set up Downie to download just the audio. That way you can listen offline, saving bandwidth. But when you want to download full videos again, just go back to Preferences > Postprocessing and change the preset from Extract Audio Only back to None. In Preferences > Postprocessing, you can also have Downie auto-convert everything to MP4, if, for example, you plan to send your downloaded videos along to a phone or tablet. You can also have videos automatically open in Permute if you want to convert for specific devices—more about that in a minute. 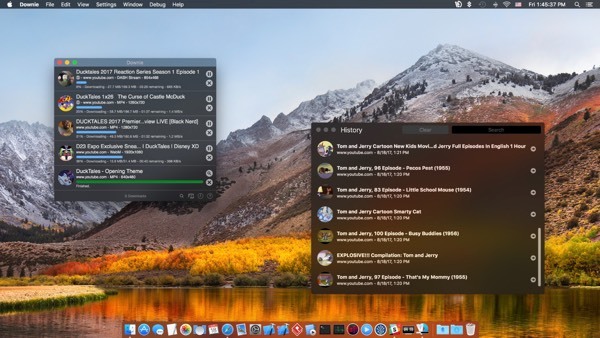 Downie lets you search for videos to download free on the big sites like YouTube, Vimeo, and TED, right from the search field at the bottom-right of the main window. That Search popup also has a Top Downloads tab, too. But if you’re worried about your kids searching for adult content, or finding it in Top Downloads, you can filter searches and disable Top Downloads in Preferences > Parental Controls. Here are a few more cool little features you can find in the Preferences. Delayed queue start, so you can download stuff in the middle of the night. Group downloaded videos by site or playlist, inside your Downloads folder or whatever destination you set. Download subtitles or not, or only when the subtitle track has a key word (say, a language) in its name. Use a proxy server to find videos that normally wouldn’t be available in your country or geographical area. If you want to download video online in batch, get all of them into one file and let Downie scan it. Permute, which is also part of Setapp, is a media converter made by the same developer, so it seamlessly integrates with Downie. While Downie can automatically grab just the audio, or convert all videos to MP4, for anything beyond that you can have downloaded videos open automatically in Permute. Permute has presets for every device, can convert videos to audio files, supports subtitles, and can even crop videos or rotate them 90 degrees, in case you were holding the camera wrong. It also stitches back together videos that are downloaded in multiple parts. And since both Downie and Permute are part of the Setapp family, there’s no reason not to try them together!